Jedna z novějších švédských akvizic, ovšem s ostřílenými muzikanty. AXIS OF DESPAIR!!! Zrovna v těchto dnech si připomínáme úmrtí grindcoreové legendy, kapelníka legendárních Nasum, Mieszka. Kapela AXIS OF DESPAIR ze švédského Örebra pokračuje v odkazu této legendární kapely, aby taky ne, když za bicí baterií sedí jeden z nejpovolanějších, Anders Jakobson!!! Spojil síly se členy kapel Coldworker, Livet som insats, Nervgift, Overtorture a Volturyon. AXIS OF DESPAIR vznikli na jaře 2014 a do této doby mají na kontě dvě sedmipalcové nahrávky totálního grindcore, který opravdu drtí vše živé!!! Na rok 2018 AXIS OF DESPAIR plánuje nahrát celou desku a my se radujeme, protože je dostat na OEF 2018 je skvělá zpráva na začátek nového roku!!! 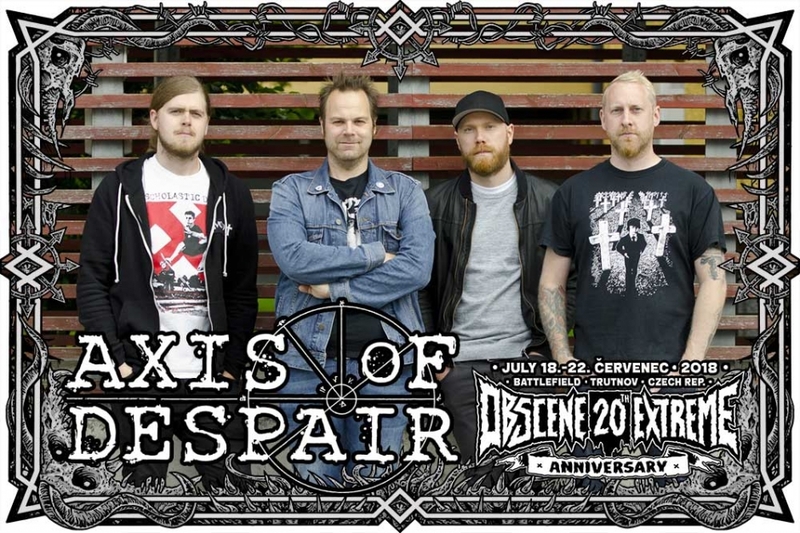 Axis of Despair is a grindcore band from Örebro, Sweden. Although the first incarnation of the band can be dated back to the last days of 2013, the band came together as a fully working unit in the spring of 2014 when the line-up was finalized and the band name was decided. A number of songs had been in the works for quite some time and in November the same year the first samples from the band was released on Facebook and YouTube, giving just a slight taste of Axis of Despair's grindcore. During May and June of 2015 Axis of Despair went into Soundlab Studios in their hometown and recorded 12 songs for two 7" EP's. These EP’s were released during 2015 and 2016 as “Time and Again” (Selfmadegod Records, November 2015) and “Mankind Crawls” (Give Praise Records and Spela Snabbare Records, October 2016). In June 2016 Axis of Despair debuted live supporting Black Breath in Stockholm. Two additional shows have been held in their hometown after that. Most of 2016 and 2017 the band spent in the rehearsal room writing songs for an upcoming full length album. During the summer of 2017 Axis of Despair yet again went into Soundlab Studios recording a total of 26 songs to be released as an album and possible a third 7” EP. The album is to be expected during 2018. Axis of Despair features former and present members of band such as Nasum, Livet som insats, Coldworker, Nervgift, Overtorture and Volturyon.